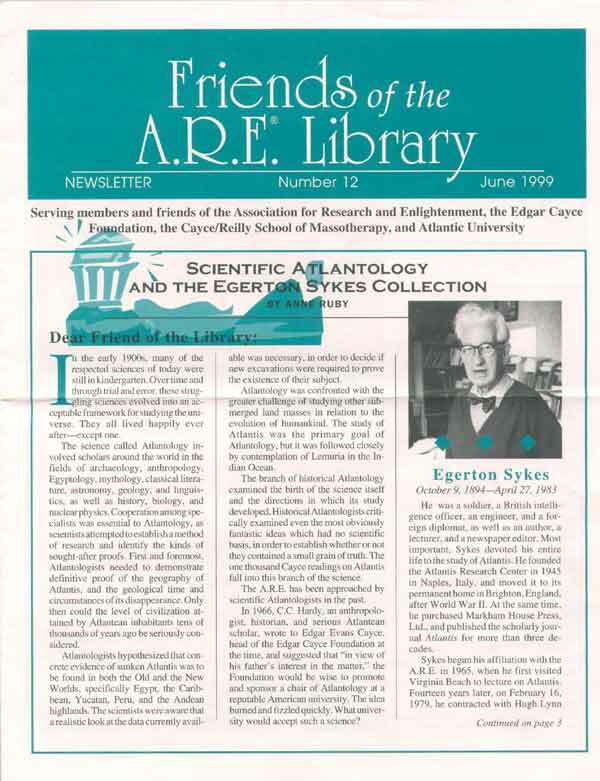 Egerton Sykes (1894-1983), was not only the creator of the largest private collection on Atlantis in the world, he was a mythologist, amateur archaeologist, writer, and editor, who prided himself on knowing every scientist around the world in the field of Atlantology from 1912 to 1950. Sykes acquired a taste for unknown civilizations as a boy after reading Jules Verne’s Twenty Thousand Leagues Under the Sea. He began collecting books on Atlantis in his teenage years, a fascination that flourished during his eventful thirty-three year career in Europe and the Middle East as a foreign correspondent, British Intelligence Officer, and diplomat. During this period, Sykes lived in twenty-eight different countries, allowing him to search museums and bookstores for material pertaining to Atlantis, preferably books in their original language, since Sykes mistrusted the accuracy of translations. As a result, Sykes built up an unrivaled personal collection of well over six-thousand documents in fifteen different languages. 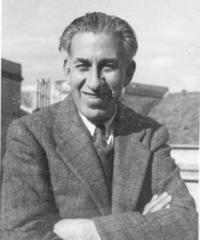 Sykes retired after World War II and settled in Brighton, England, to lecture, write, and run a publishing house, Markham House Press Ltd. For the next thirty-one years, Sykes published four magazines, including two bimonthly research journals, Atlantis (1948-1976) and New World Antiquity (1954-1979). (Journals are available to purchase on CD.) 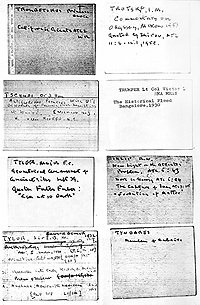 See a bibliography of Sykes' writings. 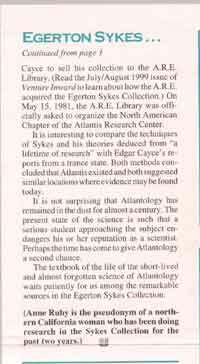 At the same time, Sykes also founded three organizations: The Atlantis Research Center, The Hoerbiger Institute, and The Avalon Society. The Atlantis Research Center was founded to investigate the probability of the lost continent of Atlantis having been the source from which was drawn the fundamental cultures of the two hemispheres. The Hoerbiger Institute was established to investigate the Theory of Cosmic Origins put forward by Hans Hoerbiger in 1913. The Avalon Society was created to investigate the probability that from the Megalithic Culture had evolved a system of orientation of sacred sites based upon a common astronomical knowledge; a system of measurement for the construction of these sites; a system of surveying; a system of naming sites; a calendrical system based upon the formulation of the Zodiac; and to consider whether the Arthurian legends, the Welsh Triads, the Nordic Sagas and Eddas, and the Celtic Legends may all contain confused recollections of this period. All three societies aimed to disseminate knowledge; link up with other bodies both in the Commonwealth and abroad; and to organize excursions to full sized expeditions for the purpose of investigating sites containing material of possible interest. Sykes first visited the United States in 1965 on the invitation of Hugh Lynn Cayce of the Association for Research and Enlightenment (A.R.E.). Sykes also lectured in Washington DC, Baltimore, Boston, Philadelphia, and to the Explorers Club in New York. Sykes’ general impression of the USA was one of kindness from everybody, and he was thrilled by the inexhaustible appetite for knowledge expressed by the American people. Sykes was held in high regard by the learned societies to whom he lectured and wrote for. The list included The Explorers Club of New York; British Psychological Society; Royal Institute of International Affairs; Royal Geographical Society; Royal Institution; Royal Anthropological Institute; Royal Central Asian Society; British Institute of Management; Royal India Society; Institute of Industrial Administration; Royal Societies Club; Junior Carlton Club; and Royal Aero Club. Sykes’ conclusions about Atlantis were based on a comprehensive study of ancient maps; a world survey of submerged cities; studies of rock magnetism; petroglyphs and cave paintings; linguistics; historic and mythic records of the event; physical remains of contemporary cultures; early trans-Atlantic movements; and astronomy. In his lifetime, Sykes witnessed many outlandish ideas, once labeled wild heresies, proven otherwise: the atom split down to the level of the quark; the development of flight from the Wright Brothers to Space capsules; Marconi’s spark transmitter grow into the colored TV of today; the beginning of culture pushed back 7000-8000 years and even earlier; the acceptance of the Viking incursions into North America; and the plethora of dating processes beginning with Carbon 14. Sykes had a wide appreciation for the mystical approach, and was interested in antigravity, map dowsing, the zodiac, the possibility of present day Neanderthals and dinosaurs, and extraterrestrial life. To use his own ESP, Sykes realized the need to have an intuitive knowledge of the subject, and the ability to focus one’s mind on it to the virtual exclusion of everything else. When asked about metaphysics, he commented, “There is no phenomena that is not subject to the natural and ordinary laws of the universe”. With respect to all things Atlantean; however, Sykes thought it best, under the circumstances, to present his left-brain to the world. Sykes made several comments about needing a successor. 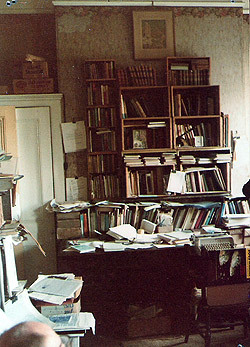 He had no one to leave his library to and no one to carry on the research. His only son, Peter, was killed in World War II. Sold to the highest bidder in 1979, the Egerton Sykes Collection is presently housed at the A.R.E. Library in Virginia Beach. "A great oak tree has fallen and the forest will never be the same again... Bill Sykes died full of years... He remained in possession of his faculties, physical and mental, until the end. He was held in high regard by the learned societies to whom he lectured... and for whom he was still writing at the time of his death. 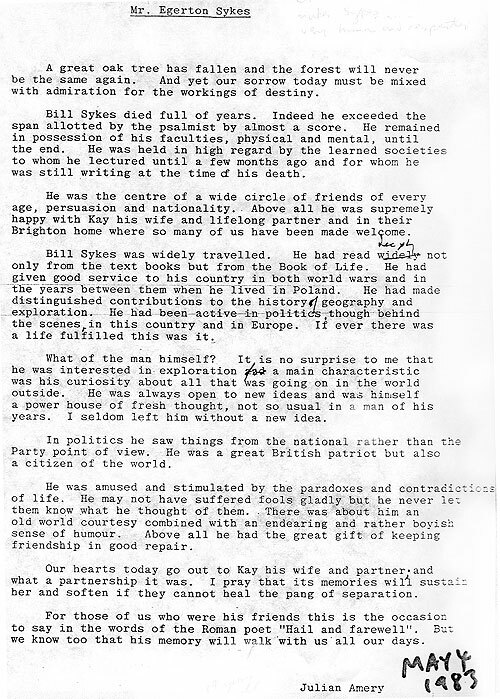 He was the center of a wide circle of friends of every age, persuasion, and nationality... Bill Sykes was widely travelled. He had read widely not only from the textbooks but from the Book of Life. He had given good service to his country in both world wars... He had been active in politics... If ever there was a life fulfilled this was it... He was always open to new ideas and was himself a powerhouse of fresh thought, not so usual in a man of his years. I seldom left him without a new idea... There was about him an old world courtesy combined with an endearing and rather boyish sense of humor. Above all, he had the great gift of keeping friendship in good repair." Indeed, Egerton Sykes left the world a wonderfully thought-provoking legacy. Did Atlantis truly exist? The jury is still out, but no matter which side of the fence one sits on, one cannot but help tip his hat in respect to the lifetime of work by the dedicated Englishman. 'Twas on a spring day in 1983, Sykes’ ashes were scattered in the Garden of Remembrance on the southwest side of Woodvale in Brighton. On that same day, sadly to say, Atlantology lost its most powerful supporter, and went into hiding... but the story is far from over.